Like the Moon, the Earth has phases: first quarter, last quarter, etc. But the phenomenon is reversed compared to the Moon. 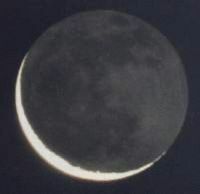 Thus, when the Moon is near to new Moon, the Earth is near to full Earth. The Earth reflects part of the light from the Sun, lighting the part of the Moon that is not lit by the Sun. This gives the unlit part an ashen colour.